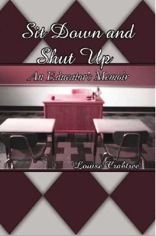 Were you ever bullied or harassed at school by your peers or the administration? A girl who habitually tormented me in fourth grade found me alone in the school bathroom and bit me on the arm of my new sweater, her mouth full of half-masticated crackers complete with saliva. Yanking her around by the hair of her head ended all attacks. Are some children reluctant readers? Do the schools require reading classics before a child is a capable reader? No time left for reading for one's own interest? How much time is given over each year to activities unrelated to academics? Learn what life is really like from inside the schools based on thirty-nine years of experience as an educator. This book is my story but it shows how education in America has changed over the past four decades and how we have moved from academics to “fun and self esteem” with academics left out. Several schools have begun using this book as a starting point for internal discussions on what went wrong, how they got where they are today and what must be done to fix the problems in education. This memoir - containing anecdotes and experiences from birth to present, illustrating what is good about education, what is not, solutions suggested - will enlighten and entertain all readers. Actual lessons and a reading list are included. "It Was The Best of Times"